The TruEdge-I plasma cutting machine provides high quality small holes with reduced taper, reduces cost per part and improved cut quality at an attractive entry level price. 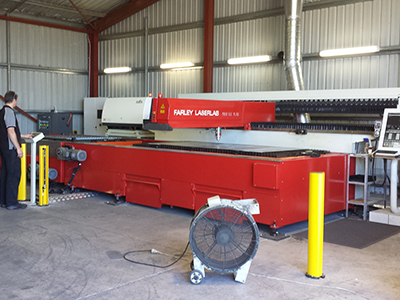 The TruEdge machine is a great plasma cutting solution for companies that have little to no plasma experience, because of the high level of integrated plasma cutting technology. This technology is very easy to use and can have any operator with minimal to no plasma cutting experience producing cut parts better than the most seasoned and experienced professional. The new range of Farley TruEdge machine incorporates all the latest Hypertherm plasma cutting technology including True Hole technology. The TruEdge is a quality built motion system equipped with digital SERCOS Bosch motors and drives.